Mehrab Hossain was born July 8, 1987. He is a Bangladeshi cricketer who came through successfully through the age groups of the country. He was a member of the U-19 Bangladesh National Cricket Team of the 2006 U-19 Cricket World Cup and was called in the national team for the first time at the 2006 ICC Champions Trophy. He is a left-handed middle order batsman and slow left arm bowler. He represented Bangladesh in 12 U19 ODI matches, taking 16 wickets and scoring 213 runs. In May 2007 he was picked for the Bangladesh Test squad for the first time, for India's tour of the country. Mehrab was initially a part of Bangladesh's Under-19 and A team setup and captained the Bangladesh academy team on a tour of Pakistan. He made his international debut for Bangladesh during the 2006 Champions Trophy in India and started out as an opening batsman in the ODIs before dropping down the order. He scored a fighting 83 in only his second Test, against New Zealand in Chittagong. Still inexperienced at the Test level, he will be looking to seal his spot in the middle order. Find Mehrab Hossain jnr profile and stats of batting, bowling and fielding including latest updated news of Mehrab Hossain jnr, videos and images at Hamariweb.com. 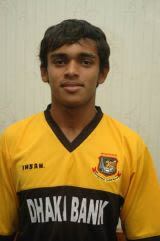 Also find detail Player profile and career statistics of Mehrab Hossain jnr of Bangladesh. Mehrab Hossain jnr - Find Mehrab Hossain jnr of Bangladesh Cricket Team complete player profile, number of matches, runs score, wickets & catches, Statistics, Records, Mehrab Hossain jnr Latest News, Mehrab Hossain jnr Videos, Mehrab Hossain jnr Photos, and other Mehrab Hossain jnr Cricket Team players.